Toronto – February 9, 2019 – On February 14, activists can show their heart and share their solidarity for a better future for First Nations children, and for justice and safety for women and girls. 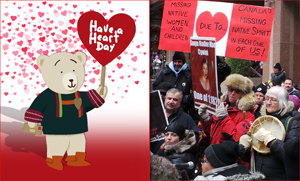 Have a Heart Day is an annual call to bring equal funding and services to First Nations children living on reserve. Sponsored by the First Nations Children and Family Caring Society (the Caring Society), this initiative is a youth-led reconciliation campaign to help ensure First Nations children get a fair chance to grow up safely at home, get a good education, be healthy, and feel proud of who they are. Dozens of Have a Heart events are planned across the country. To participate in a Have a Heart Day event in your area, find out more at www.fncaringsociety.com/have-a-heart. Activists and allies can also support the day by sending a card or letter to the Prime Minister or your local Member of Parliament asking them to ensure First Nations children have the services they need to thrive; hosting a Valentine’s Day party to raise awareness in your school or community; or spreading the word through social media channels like YouTube, Twitter, and Facebook using the hashtag #HaveaHeartDay and/or #JourneeAyezUnCoeur. To learn more, click here. Women’s Memorial Marches also take place on February 14 at a number of locations across the country. The marches and vigils honour and acknowledge the loss of thousands of women and girls who have lost their lives due to physical, mental, and emotional violence. They also call attention to the disproportionate percentage of Indigenous women and girls who have gone missing or have been murdered at a rate that far exceeds any other demographic in Canada. These memorial marches provide an opportunity to show solidarity in the fight to eliminate violence against all women. Start: February 14, 6:30 p.m., followed by march at 7 p.m.
Start: February 14, 6 p.m.
Start: February 14, 11:30 a.m.
Start: February 14, 12:30 p.m.
Start: February 16, 11:30 a.m.
Start: February 14, 5:30 p.m.
Look to social media for other February 14 marches planned in your community. For more information regarding UFCW Canada’s work to prevent violence against women and support survivors of abuse, visit www.ufcw.ca/women. To find out more about UFCW Canada’s work on Reconciliation, visit www.ufcw.ca/reconciliation.